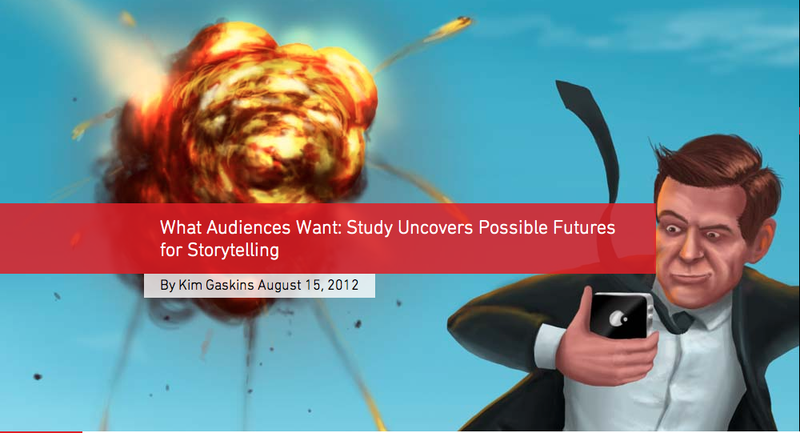 On Wednesday the research company Latitude released a pretty interesting study called The Future Of Storytelling. I highly recommend it as essential reading, and I’m thoroughly looking forward to the second and last instalment in the study series. There are a lot of good points in the study, and in my mind they all clearly point to one thing. 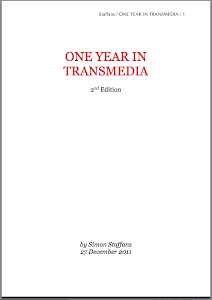 ”Transmedia” might have been a buzzword for a while. It probably still is, in the minds of many. But the term is of infinitely lesser importance; of greater importane is the fact that the audience – anyone we wish to target with our content – is already inherently geared towards transmedia. For us as content creators it can only mean one thing. Kicking and screaming, or willingly and eagerly, we will move into the world of content transcending media platforms, or story worlds and neverending narratives, of co-creation with users and co-distribution with others, of using technology to weave stories to evoke feelings and induce experiences. There is no turning back, and we do ourselves a severe disservice if we do not acknowledge this with open eyes and strive to make the very best we can of this fact. At the same time, my ”old-media-developer-and-producer”-character raises its head and highlights the fact that while all of this is very nice, someone also need to pay for everything. Just developing the mythologies and / or story worlds needed comes with a cost. As does producing for different platforms, as does distributing content to different platforms. Will we just end up doing a helluva lot more work and paying a helluva lot more money for the same return? In the meantime what we can all do is create. Create, create, create, and then create some more. Create magical worlds and stunning characters, create enchanting narrative arcs and riveting interactive possibilities. Create more and better (and why not harder, faster and stronger while we’re at it J ). Exciting times indeed! One pretty neat transmedia franchise. 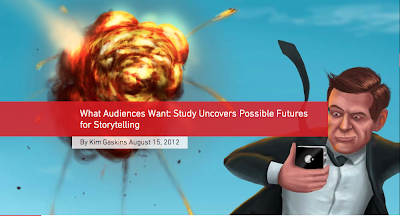 Transmedia, as we all know, originated some 20 years ago. As a practice it has existed way longer, depending on how you define it, with the Bible being quoted as one of the first instances of transmedia in practice. For several years a lot of talented people around the world have been working on transmedia projects, producing transmedia projects, promoting transmedia practices and lobbying for transmedia as a way of thinking, creatively as well as financially and from a marketing perspective. Right now, I have the feeling that the long-awaited ”ketchup-effect” has finally arrived. I hear of a new exciting transmedia project almost every other day, ranging in scope from the fairly small, like the ARG ”Miracle Mile Paradox” to the fairly big, like the Avengers-rumours about interconnected tv-series and films, from the areas of theatre to the areas of gaming – transmedia, world building, narrative superstructures and mythologies are all of a sudden found everywhere. Simply brilliant to witness. And I think I can see one shift happening already, one that only six months ago seemed like an impossibility, but now not only looks probably but even quite inevitable – the lessening of the importance of the term ”transmedia”. There are quite a few people tired of the term, which has become readily apparent in discussions over the past couple of years. I know myself that I hesitate to use the term in certain discussions; at the Pixel Lab, for instance, there was no problem using the term, but talking to possible sponsors or buyers I prefer to explain the actual setup of the transmedia project rather than branding it ”transmedia” from the outset. But now I believe the shift is happening. ”Transmedia” is rapidly becoming a term as common as ”television” or ”media”, and is starting to represent the notion of ”something more than just a movie, a book or a tv-series” in the minds of people. The fact that this ”something more” can be just about anything in scope and size is of lesser importance. And it is increasingly being taken for granted; just as the mantra has been that the audience wants to access their media anywhere, anytime, now they want to access the continuation of their stories, anywhere and anytime. It’s a bit like going to a concert. Everyone knows that the band goes off stage, the crowd shouts for a bit and then it’s time for the encore. The same thing is happening with the audience with regards to media now, except they don’t have to shout – when the book or the movie is finished, it’s time to explore the encores.